Wendy Herbener Mehne is professor of flute at Ithaca College where she was a 1995-96 Dana Teaching Fellow and the 2004 London Sabbatical Scholar. She is a member of the Cohen/Mehne Duo, a flute and guitar duo that is one of the School of Music’s faculty ensembles, and principal flutist with the Cayuga Chamber Orchestra. With Pulitzer prize-winning composer, Steven Stucky, and colleagues from Ithaca College and Cornell University, she was a founding member of the new music group, Ensemble X. Together they made recordings of chamber music by Steven Stucky, Judith Weir, and John David Earnest. Dr. Mehne has been a guest artist and given master classes throughout the United States, and has performed with the Chautauqua Symphony and at the Skaneateles Festival. 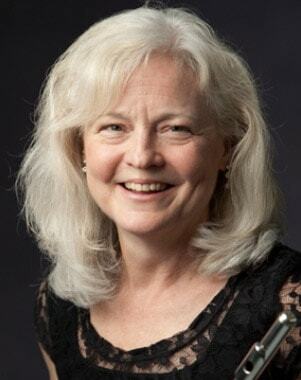 As a member of the Ithaca Wind Quintet, she gave the world premiere of Karel Husa’s Cayuga Lake (Memories) at Lincoln Center’s Alice Tully Hall and Dana Wilson’s Mirrors at the 1993 National Flute Association convention in Boston. She has also performed at Carnegie Hall, Weill Recital Hall, Constitution Hall, the national ACDA and SEAMUS conferences, the International Guitar Festival in Fort de France, Martinique, numerous National Flute Association conventions, and in broadcasts by affiliates of National Public Radio and Public Television. Dr. Mehne is a contributing author for Flutist Quarterly, Flute Talk and the Instrumentalist and has recorded for Koch, Albany, Mark, and Open Loop labels. She has been secretary of the National Flute Association, served on its executive board, and is currently a member of their board of directors. Her new CD, The Conjurer: Chamber Music for Flute by Dana Wilson, was released in August 2016.